I cannot begin to tell you how excited I am to be teaming up with Steph and Joy, founders of Scottsdale Moms Blog, for this event! If you’ve never checked out Scottsdale Moms Blog… do it! It’s full of community information, things to do, and posts written by real moms like you! Thank you to The Big Bang in Tempe for hosting our event THIS FRIDAY! *Be sure to come with a full tummy as The Big Bang will not be serving food during the event. There’s only about 30 spots left… so hurry and RSVP! *Note: Free Cover Charge and Swag Bags are guaranteed only for those on the RSVP list. Happy Random Friday! I’m so very excited to announce that I have my very own OpenSky coupon code! These codes don’t happen very often. Use it to purchase any item from OpenSky at 30% off! It’s only good through Sept. 30th. I just added some really awesome things… including a photo light box! If you sell products online… great pictures are a MUST! You can click here to Buy Now! So check out what’s new this week in my OpenSky shop and continue to support the organically grown, mom and pop shop sellers and distributors. Thanks! 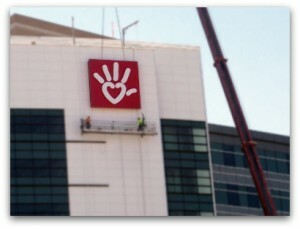 Phoenix Children’s Hospital has a special place in my heart. I spent a week there with my daughter, Allison, when she was diagnosed with Type 1 Diabetes. The staff is amazing. Each member knowledgeable about his or her field. The training I received as a parent was more valuable than I could express. I’m excited for PCH as they continue on their expansion journey. I feel almost as if I’m a member of a growing family. This morning I got an email from a friend sharing with me that the new “hand” sign was up. I felt the need to share it with you… my friends and my community of readers. Congratulations to Phoenix Children’s Hospital on their amazing expansion program and their vision to become one of the best pediatric hospitals in the nation. We are already a gaming family. I grew up on all the old consoles. My family spent hours competing… even my parents. It's truly one of my most vivid family memories. As a family, we've passed this on to our children. Even at ages 4 and 6… they love a good video game. Especially ones that allow them to express themselves… whether through creativity, sound, or movement! Here is our dilemma… daddy houses the PlayStation3 in a special room of the house. Nobody plays it but him. We are granted the wondrous opportunity to watch now and then. Sometimes we even gather around in the man cave and watch Blue Ray DVDs on the Playstation3. 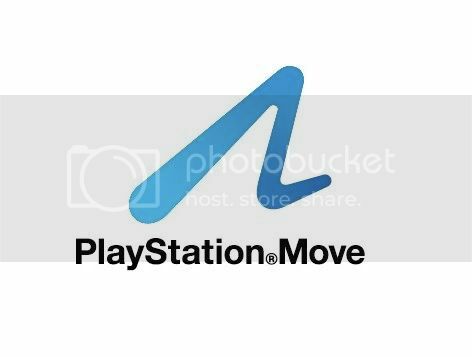 If suddenly, one night, my family was graciously given the PlayStation(R)MOVE… things would definitely change in our home. It would level the playing field. Now all of us could play. We wouldn't be limited to the shoot 'em up, adult games that daddy plays on "mute" anymore. The girls would instantly be in love with "Eye Pet". The Eye Camera takes a virtual shot of your room and a pet beings to romp around and virtually interact with your family. How cool is that? I can hear the squeals of joy already. I am most excited about "Heavy Rain". I've already been secretly playing it when daddy isn't around. It's intense. My actions and reactions control how the game plays out. I can only imagine how life like it will feel to fend off intruders in my house by my own movements! Thrilling! The best part of all this is… because we already own a PlayStation3… we can add the PlayStation(R)MOVE for only $99 with the MOVE bundle package! Someday the package delivery man may knock on my door an bestow all this joy upon my family. Until then… we'll mark it down on our wish list. Oh, and, I'll still be sneaking in the man cave to beat all daddy's scores. Happy Wednesday! I love Wednesdays because I get to share a yummy snack with you!My girls love bananas. They love them even more when they’re frozen! There’s a million ways to dress up a frozen banana…but today… I’m going to share with you the yogurt covered banana. I like to use vanilla yogurt for this snack. You can use whatever flavor you’d like though. Cut your banana into thrids. 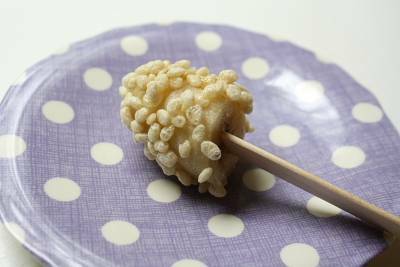 Poke wooden popscicle sticks into the pieces. Dip your banana into the yogurt and go for a thin coat. Roll your banana into your favorite cereal. I find that this one goes well with Rice Krispies. Granola is also a yummy alternative! Freeze your banana creations for an hour or so. Then… enjoy! I love me some Angry Julie Monday. She’s not only an amazing photographer… but she’s also pretty darn crafty! Today, Julie is sharing with us a great idea she posted about back in June. If you love the idea of a crisp, clean, white, shiny, organized space… then this post is for you. 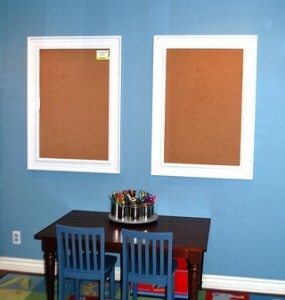 The first thing they did was tape off the bulletin board area… you know… to protect the pretty cork! Then they sanded and primed the wood frames. Finally… they sprayed them with 2-3 coats of glossy white paint and a coat of clear gloss. I won’t go into all the details of Julie’s OCD and hanging things issue… you can read all about it here. If you aren’t reading her blog… you should be. And if you’re not following @AngryJulie on Twitter… you’re missing out! Thanks for lending us your inspiration today Julie!